There is no doubt that David Warner is a destructive batsman; however despite making his ODI debut 3 years before his Test debut, he was never the accomplished ODI opener and was more successful at test level. That is quite ironic given his style of play, but his record shows how he excelled in tests and never really did as well in ODIs in the initial part of his career. In 5 years, between his ODI debut in January 2009 till the end of 2014, Warner played 50 matches, in which he managed only 2 centuries. His average during this period was a meager 31.4. Right now, Warner, is having his most prolific ODI summer ever. He has scored 5 centuries in his last 10 ODIs, which is the most centuries for an Australian batsman in an ODI season (equal with Matthew Hayden). Warner started the year 2015 with his 3rd ODI century, and he has never looked back since. 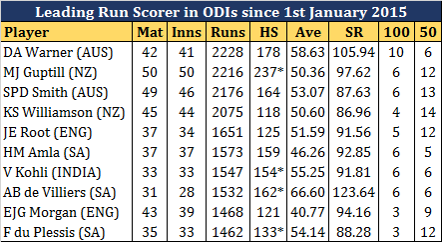 In 42 ODIs since the start of 2015, Warner has amassed over 2,000 runs at a phenomenal average of 58.6. He smashed 10 centuries during this period and 6 half centuries. Warner is averaging almost double of what he did in his first 5 years of ODIs, in ODIs over the past 2 years. He has taken his ODI average from 31.4 at the end of 2014 to just over 43. His turnaround has been so awesome that he is the leading run scorer in all ODIs played in the past two years, since 1st January 2015. Wednesday, March 15, 2017 This comment has been removed by a blog administrator. Monday, April 24, 2017 This comment has been removed by a blog administrator. Friday, May 05, 2017 This comment has been removed by a blog administrator.